It's a 25 percent loss that represents the state's first ever decline in production, and olive oil producers across the county and state are feeling its impacts. "We got hit pretty hard here," said Michael Carpenter, owner of Pepper Oaks Farm, a 50-acre farm in the Santa Ynez Valley that is home to several thousand olive trees and a mill that produces certified extra virgin olive oil. 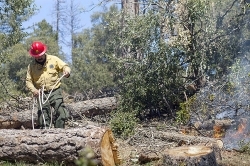 The uncharacteristically warm weather throughout January and February of this year caused his trees to blossom earlier than usual, Carpenter said. Then frost followed in March, stalling growth and damaging the fruit that had already started to appear. Carpenter said that when nature stops cooperating, there's not much farmers can do to save crops, and while he's had difficult years before, "nothing like what we saw here." Production on his farm decreased by about 70 percent between this year and last. "This year certainly has been very, very difficult," he said, adding that when there's less oil, there's less revenue. Still, Carpenter said he wasn't forced to make any staffing cuts this season, and he's tried to be transparent with his customers, who he said have remained understanding and loyal throughout the shortage. Fortunately for them, his prices haven't changed significantly, although Carpenter said cost increases are often the result of smaller harvests. And despite the massive decrease in production, Carpenter said he expects next year's fruit to be abundant, "but we'll see what Mother Nature has to throw at us," he said. Theodora Stephan, owner of Global Gardens in Los Olivos, said her crop was affected by a hot winter and March frost last year. 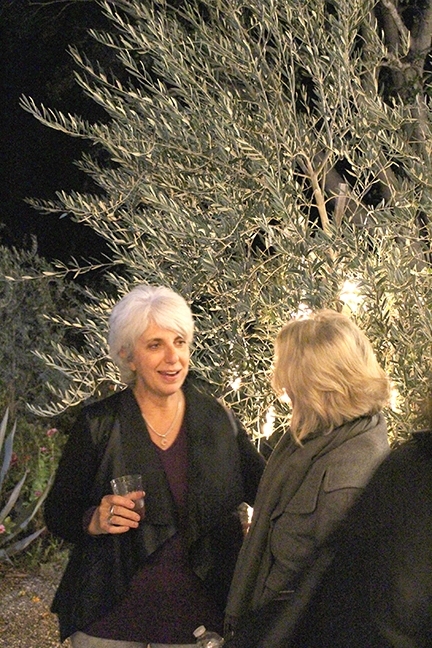 Pictured: Stephan spoke with guests at a Nov. 30 party for her farm stand club members. There are at least 33 other olive growers like Carpenter in Santa Barbara County, according to the county's assistant agricultural commissioner, Rudy Martel, who said about that many are registered for pesticide use in the county. Most, or all, of them are likely dealing with issues similar to Carpenter's, according to Patricia Darragh, executive director of the California Olive Oil Council. Darragh said this year's weather had major consequences for olive farmers and oil producers throughout the entire state. Although harvest is still ongoing–it usually runs from October to mid-December–Darragh said it's the worst she's seen in more than 20 years with the Olive Oil Council. "This is the first time we've had a decrease in production," she said. Overall, Darragh said she hasn't seen much of a change in pricing across the state. Olive oil is already an expensive commodity to buy because it's so costly to grow, and Darragh said California growers are working to keep prices as reasonable as possible through the shortfall. But if next year turns out low yields, she said prices would have to be re-evaluated. As of now, Darragh said it looks as though next year will be much more fruitful. Olives are still one of the fastest growing specialty crops in the state, and Darragh said several thousand more olive trees will be planted within the next year. "We're hopeful that this was just a one time problem," she said, "and that next year's crop will be very robust." Olives aren't the only crop to have suffered at the expense of an increasingly unpredictable climate. In September 2017, California avocado growers saw their worst harvest in nearly 30 years after a five-year drought. It's an issue the state is keeping a close eye on, Darragh said, and one that the agricultural industry will need to address in the near future. Although some years are always better than others in the world of farming, some local growers, including Theodora Stephan, worry that this year was just the beginning of a long fight with changing weather patterns. Stephan owns Global Gardens, a farmstand in Los Olivos that sells specialty olive oil and vinegar. She farms roughly 12,000 olive trees in groves in Los Olivos, Paso Robles, Santa Ynez, and Los Alamos. After her olive trees blossomed in late January, they froze in March, killing nearly all the olives that had started to grow. "And I was like, 'That's it, I'm not going to get one olive,'" Stephan said. "Many, many olive groves in the state of California did not get one olive." Her trees saw a secondary bloom in May, and she was able to produce oil from another grove she planted a few years ago that only recently became mature, but Stephan said her production this year was still only about half what it was the year before. While the year's low production hasn't impacted her sales, prices, or labor, Stephan said she's worried about this coming harvest, and all those following. "It's really scary, because we have no frost in the forecast now and it's December. We always have frost in late October," Stephan said. "I'm worried about getting into a pre-bloom again, because the trees are just–everything is confused." Staff Writer Kasey Bubnash can be reached at kbubnash@santamariasun.com. Managing Editor Joe Payne contributed to this story.